The history of Sampdoria begins in 1946, with the merger of its two precursor clubs – Sampierdarenese and Andrea Doria. As it was the custom in those days, the new club's name was created as a mash-up of both merger club's names. In addition to that, the club's crest and jerseys have since featured all four colors commonly associated with the former teams: blue, white, red and black. The initials "UC" stands for Unione Calcio and could be translated to "Football Union". The starting line agianst Lazio in the season 1990-1991. The first 30 years of competing were not kind to Sampdoria. During this period, the club did not see much success and was relegated to the second division on more than a single occasion. The 70s were an especially disappointing time, and the club seemed destined to languish in Serie B for the foreseeable future. Paolo Mantovani's arrival at the club in 1979 as the new president was the first signal of a new, more successful era. The new president's ideas and money investment proved to be a huge positive influence for the club, which managed to return to Serie A in 1982 and win their first trophy (Coppa Italia) in 1985. Vujadin Boskov's appointment as head coach in 1986 was another step in the right direction, and he led the team to two more Coppa Italia titles and the club's first European trophy, the Cup Winner's Cup. 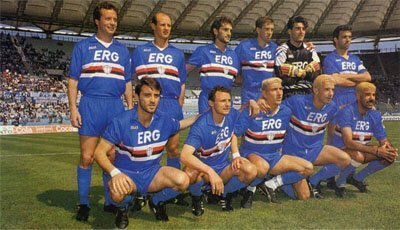 The cherry on top came in 1991, with Sampdoria winning their only Scudetto. The very next year, the club managed to reach the European Cup Final and were narrowly defeated by Barcelona in extra-time. Mantovani's death in 1993 came as a shock to everyone involved with the club. Even though Sampdoria won their fourth Coppa Italia trophy the same season with Sven-Göran Eriksson as the coach, they were soon forced to start selling their best players due to financial troubles. Not long after, the club was once again relegated to Serie B and remained there until 2002 and another financial injection by its new president, Riccardo Garrone. The club promptly returned to the first division and continued to function by becoming a venerable training ground for young players, of whom many were sold for noteworthy transfer fees. The features of the club's crest includes the four colors associated with the Sampierdarenese and Andrea Doria teams that was merged into UC Sampdoria. The black drawing pictures a sailor, called Baciccia after a local patron.